From time to time I get the craving to race around the desert at high speed. There is just something about putting on the body armor and helmet and racing for hundreds of miles around the desert at break-neck speed with my buddies. Temple Mountain is our most common destination. Why do I like it so much? Because it is the exact opposite of my 'regular' life. Two days in the dirt and I am good for two months. Really, it is the perfect weekend. It relieves all the stresses of modern, monitored life. It goes down like this. Pick up friends. Drive South to Temple Mountain. Set up camp. Moto past dark. Build big fire. Sleep. Moto. Drive home. 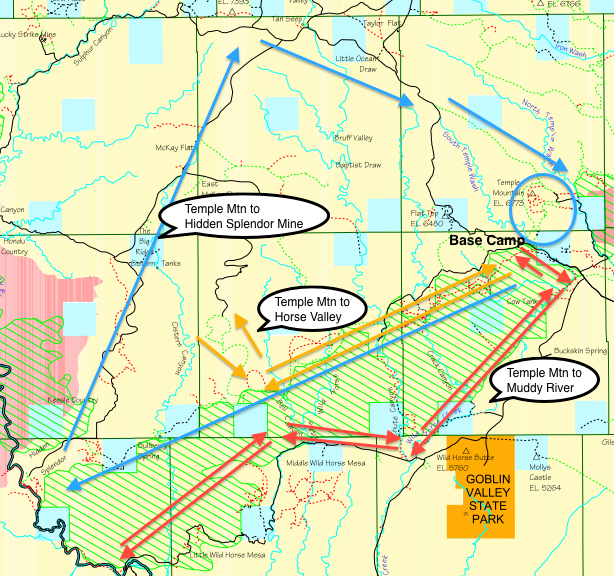 We base camp at Temple Mountain where there are good bathroom facilities and there is plenty of space to spread out. Temple Mountain has great trails immediately around the base of the mountain. The area has a very old, cool mine and related ruins and junk. Temple Mountain was formerly the big supplier of uranium for Uncle Sam's nukes. 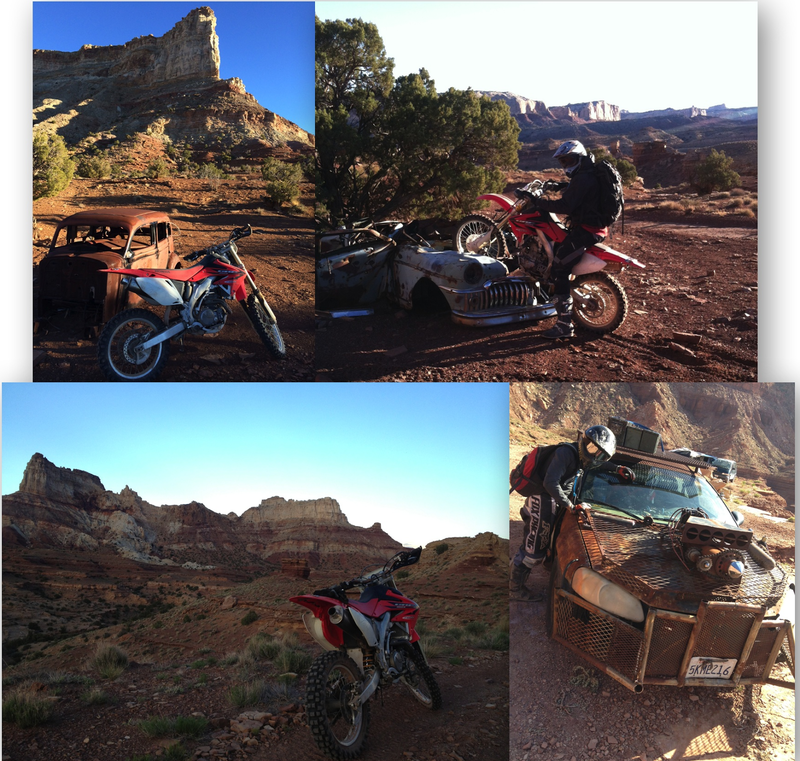 Now it is BLM land loaded with old dirt roads and trails that lead to hundreds of the old mines. And no cell signals - bonus! This is one of the larger abandoned mines in the area. This is a good ride. 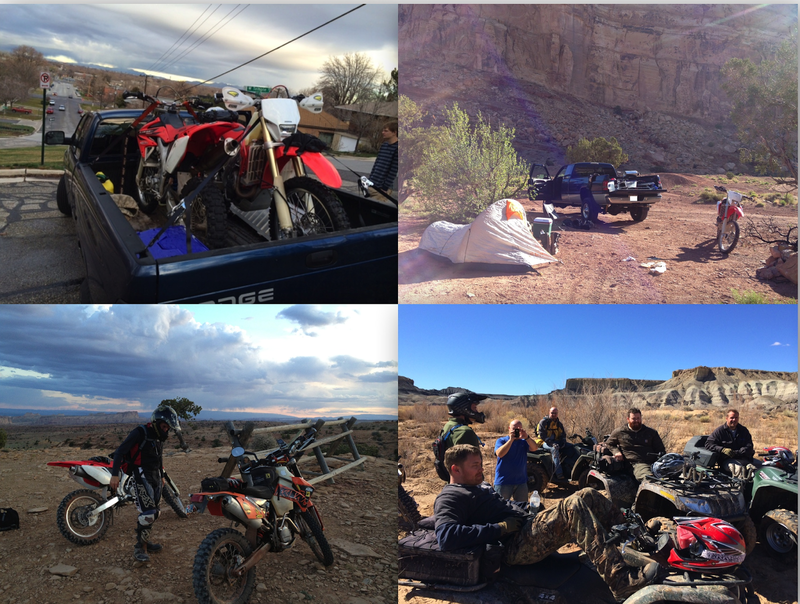 Straight from camp, you ride on the paved road about 14 miles to Little Wild Horse Canyon where you hit dirt and ride a really fun, fast sandy road through canyons and through super cool landscapes to the Muddy River. The only reason to cross the Muddy is to get to Caneville (made famous by Nitro Circus) where you can ride what is essentially God's skate park for dirt bikes. Think 200 foot-high hard sand half-pipes and you get the idea. This is a really fun ride. The first half is wide enough for Jeeps, but then it gets narrow and much more technical. Don't be intimated by the first climb on the trail, which has a 100 foot drop on one side, is steep, and has lots of rocks. If you get through that you can easily enjoy at least the first half of the trail. Keep going and you'll enjoy a very technical, but doable ride. It ends up at Hidden Splendor Mine, which sports a gravel airstrip in the middle of nowhere. Really…an airstrip in the middle of nowhere! Surreal.